Cricketer Hardik Pandya might get into trouble for no supposed fault of his, after a Rajasthan Court has ordered an FIR to be filed against him, for a tweet which was posted from a parody account of his. These comments were made on 26th December, 2017. As per initial reports, a special court in Jodhpur had directed the police to file an FIR on Wednesday, based on a complaint which was filed D.R. Meghwal, a supposed member of Rashtriya Bhim Sena. Madhusudan Sharma the special judge in question of Scheduled Caste/Scheduled Tribe cases passed the order, after Meghwal alleged that Luni police station’s in-charge was refusing to file a case against the cricketer. 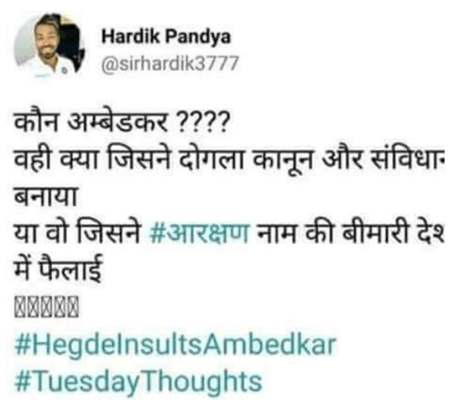 Media reports have claimed that the tweet in question is transcribed as, “Which Ambedkar ??? The one who drafted a cross law and constitution or the one who spread the disease called reservation in the country”. As per the complainant Meghwal, the comment was derogatory towards Ambedkar and attempted to spread hate and caste division in the society. He thus demanded that Pandya be given adequate and suitable punishment. As seen in the above screenshot, the twitter handle of the account in question is “sirhardik3777”. 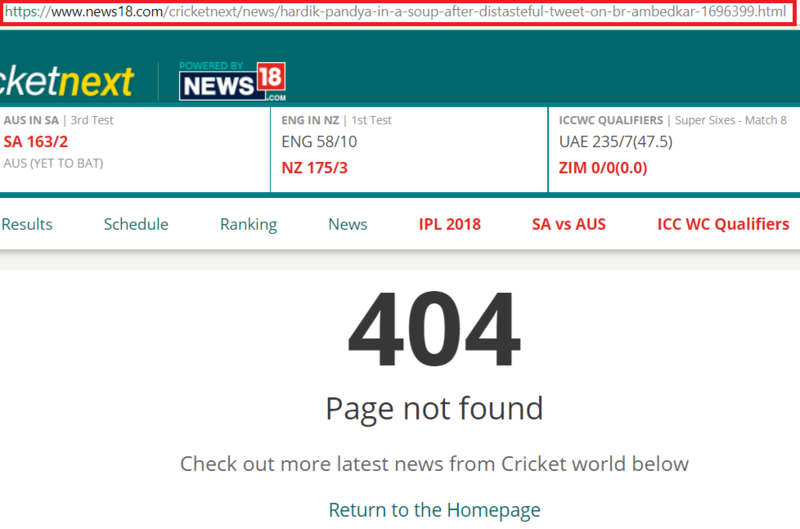 Which is different from the verified twitter account of Hardik Pandya which is, @hardikpandya7. The parody or fake account has since then been either deactivated or deleted. If the events described by the media reports are indeed true, then it raises the question as to why did the complainant and the court did not verify the basic facts before filing the case and ordering an FIR respectively.